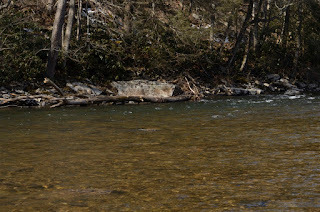 I stopped along the Dry Fork River on Sunday (2/24/13), just to let the dogs out for a walk. The sky was blue and the winds were somewhat calm but the air was still quite cool. We pulled of in the mud and snow; downstream from Jenningston. I noticed that there was some underwater activity going on. There were hundreds of these Case-Maker Caddidflies clinging to the rocks in the calm shallow water areas. Some were actually crawling around, seeming to jockey for position and intercept some rays of sun. Case-Maker Caddisflies are of the (Limnephildae) family. They live in stationary waters and can be found in the streams margins and calm backwaters.They are climbers and clingers and do not attach their cases to the substrate. They are shredders and feed upon decaying vegetation. 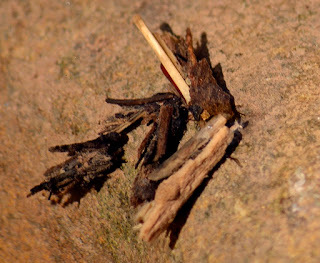 The stick-worms in the photo are probably from the genus Pycnopsyche and will hatch into adults during mid-summer. No matter what you want to call them; they are fish food. There are millions of them out there in the streams and they are available year-round. They don't look like Power-bait either, do they? Are You Taking Part ? Why Not? 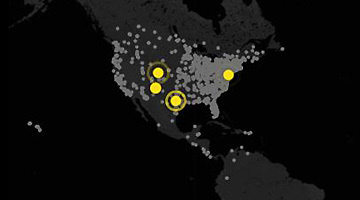 Yellow dots on the map show where checklists are being submitted in real time. The 16th annual Great Backyard Bird Count has officially begun! We're on a record-breaking pace with 928 species already reported by mid-day on the first day. The previous species record for the entire four-day count was just over 600! Today through Monday, February 18, we invite you to be part of this massive citizen-science effort. Join tens of thousands of fellow bird watchers from around the world by counting birds and submitting your checklists to www.birdcount.org. Simply watch birds for at least 15 minutes at any location and tally the number of each bird species you see. Submit a new checklist for each day and for each new location. You can count in as many locations as you like. Just be sure to enter a new list for each site. Forward this message to friends, neighbors, and relatives asking them to participate. Every checklist counts! Send a GBBC eCard to encourage others to start counting. Fill your bird feeders to attract more visitors to your yard. Charge your camera batteries so you can capture the perfect picture and upload it for the GBBC photo contest, or snap a quick shot to document a rare species. Check out the 2013 gallery so far! If you’d like more information about the birds you might see in your area at this time of year (in the U.S. and Canada), download a printable tally sheet. Check this out: Jim Carpenter, CEO of Wild Birds Unlimited, longtime sponsor of the GBBC, talked about the count this morning on the network program Fox & Friends, and he brought some feathered friends with him! Don't forget to check out some of the great prizes you could win just by taking part in the GBBC. We'll award prizes in a random drawing from among all participants. See the prizes. A special GBBC offer on the BirdLog app is available through the February 18. You can get the BirdLog app for iPhone (iOS4 and higher) and Android smartphones for just 99 cents. BirdLog allows you to upload your sightings from the field into the free eBird online checklist program as well as the GBBC. Take it for a test flight today! GBBC participants can also get a special deal from Thayer Software. You'll receive a 20% discount on Thayer Birding Software DVDs at the OnlineNatureMall. Just enter the promotional code “GBBC” at checkout. Offer valid now through March 30. As bird sightings pour in at a record-breaking pace from around the world, our technical team is working hard to help keep all systems up and running smoothly. Some participants may have had trouble connecting to the website or signing in this morning. The team has resolved these issues, so if you encountered a problem before, please try again. • Remember that usernames and passwords are case sensitive. Double check your capital and lower case letters. • If you're not yet signed in, you'll see two options after you click on the "Submit Your Checklists" button. Select the one you want—to either create a new account or sign in to an existing one. Thank you for your patience and understanding! We are thrilled to see so many people participating from around the world. As the count continues, if you have trouble connecting to the website, please try again another time. You can submit your data any time during the count and afterward until March 1. Keep up with us on Facebook and talk about birds year round! If you're new to birding, start learning a few of the most common species first. 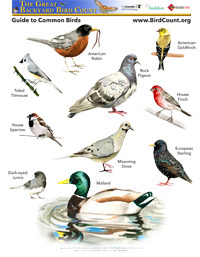 Download and print our PDF Guide to Common Birds. This poster features beautiful watercolors of some of the most common and easily identified birds found in the U.S. and Canada, and is a great way to start learning about common North American birds. Great Backyard Bird Count & eBird !!!! Are you ready for the 2013 Great Backyard Bird Count (15-18 February 2013)? This promises to be the biggest year ever as we open the GBBC to the entire world and integrate it with eBird! This means that for the first time ever, the GBBC will take a snapshot of the global avifauna. This year all data entered into eBird go into GBBC and vice versa. From now on, GBBC data entry will use the eBird checklist interface, will take advantage of eBird output tools, and will be completely integrated with your personal eBird account. New visitors to eBird should be sure to check out the eBird Quick Start Guide. If you are already an avid eBirder, we ask one more thing of you for the GBBC. Please try to take out at least one or two people who don't use eBird and introduce them to counting birds and eBird. ELKINS, W.Va. – The West Virginia Division of Natural Resources announces that trout stockings on Laurel Creek in Clay County have been suspended indefinitely due to poor road conditions. Laurel Creek was added to the DNR’s stocking schedule in the mid-1990s, at which time stockings could be made throughout much of its length. A number of fords must be crossed to complete the stockings, and over the years these have deteriorated so much, that in recent years, only a few of the upper fords could be crossed. 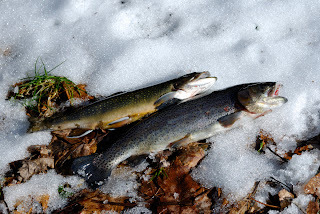 SOUTH CHARLESTON, W.Va. – The West Virginia Division of Natural Resources has several changes for the current trout stocking season, according to Curtis I. Taylor, Chief of the DNR Wildlife Resources Section. Trout stocking of Laurel Fork of Holly River in Webster County will be delayed as a result of ongoing work at Holly River State Park. The park is currently closed as contractors work to restore power and repair infrastructure that was damaged by Superstorm Sandy. “We hope to stock trout there in March,” Taylor said. Trout stocking of Boley Lake and Glade Creek (of Manns Creek) in Fayette County also will be delayed due to replacement of the bridge that spans Glade Creek and provides access to the stream and lake. Work on the new bridge is expected to be completed by late March and trout stockings should resume in April. The Corps of Engineers plans to dewater and clean the stilling basin at R. D. Bailey Lake in Wyoming/Mingo counties. Trout typically are stocked in the stilling basin below the dam and downstream. This work is scheduled for late March and is expected to be completed by April 4, 2013. Due to the scheduled dewatering, trout will not be stocked in the stilling basin until after the work is completed. Trout will be stocked downstream according to the normal schedule. New Creek Lake (Site 14), in Grant County, will not be stocked until the Natural Resources Conservation Service has filled the impoundment. The lake was drained a couple of years ago to facilitate repairs to the water-release structure. After partial filling, NRCS will test the gates used to regulate the amount of water discharged from the lake. If the tests are satisfactory, the lake will be filled to its normal pool level. Trout stocking is expected to begin later this spring. “As these waters become available for trout stocking, we will put a notice on the daily trout stocking update page,” said Taylor. I knew a dog named that; once upon a time, seems appropriate right now. I was going to Elkins this morning at around 10:30 am. I've been staring at the waterfowl along the Fossil Park straight for a month and there hasn't been much happening. The birds were standing at the water-line as I was passing by. Goose, goose, goose, mallard, mallard...Mini goose, mini goose, mallard, pull over.. Try not to get run over..Not good, too much traffic. Pull out the binoculars, yep..Two Cackling Geese; about an inch taller than the mallards they are surrounded by..Too much traffic and I need to be somewhere else. No problem, they'll still be there in a couple of hours when I come back through..Nope, nothing there around noon..Figures. Back to Elkins at around 3pm. I have to go somewhere and then have a half of an hour to kill. 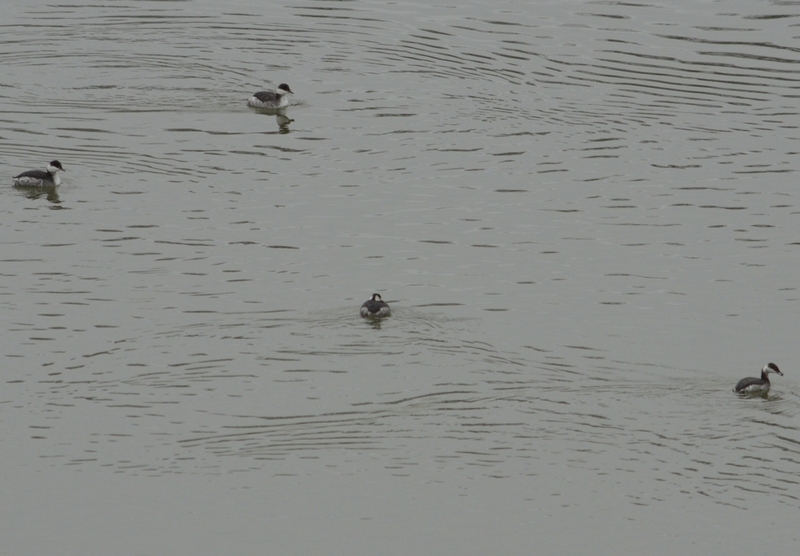 I ride out to the spillway..Nice; seven Horned Grebes and I can actually get photos of the nearest ones..Happy, now. Head to my next stop and then head home... Decide to check out the slow part of the Tygart River at the road to the Tygart Valley Regional Jail...What is that? I reach down for my better set of bad binoculars and realize that they are still laying on the bridge at the Elkins Spillway. 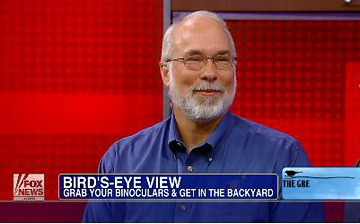 Grab the other binoculars; which are best used for traction in case you may get hung up. Two Bonaparte's Gulls are floating down the middle of the river. Nice. I turn around and fly back to the spillway for the binoculars...Amazingly, they are still there. Head back to Norton; chasing the sun, in hope of getting photos of the gulls. 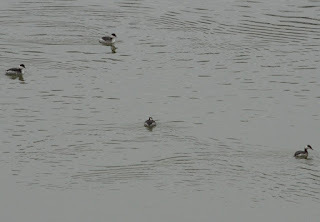 I can't find them but there is another Horned Grebe there, constantly diving. No chance for photos in the dwindling light. Oh, well just another winter day..I hate winter. SOUTH CHARLESTON, W.Va. – Wildlife biologists counted 5,252 ducks and 6,262 Canada geese during the annual mid-winter waterfowl survey in early January according to Steve Wilson, Waterfowl Biologist for the West Virginia Division of Natural Resources Wildlife Resources Section. “The number of ducks and geese counted this year increased 73 percent and 44 percent respectively compared to last year, and both are well above the 10-year average,” Wilson said. The increase was not unexpected due to weather fronts moving through from the northwest in December. Canada geese, mallards and black ducks, as usual, were the most commonly observed species in the 2013 survey. 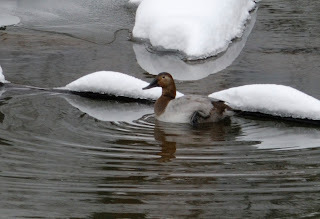 Other waterfowl observed include: canvasback, scaup, ring-necked duck, redhead, bufflehead, wood duck, gadwall, mergansers and tundra swans. Nine adult and five juvenile bald eagles were also observed. The survey was conducted on January 7, 8, and 10, 2013, and included portions of the Kanawha, Ohio, Shenandoah and New Rivers as well as Tygart and Bluestone Lakes.